CleanFreak® Reliable 18E Electric Automatic Floor Scrubber - 18"
The CleanFreak Reliable 18E is an electric powered automatic floor scrubber, that comes with a single 18 inch nylon scrub brush. 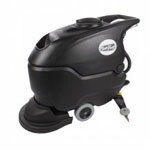 This unit is absolutely perfect for everyday scrubbing on tiled floors. You never have to worry about recharging this machine between scrubbings because all you have to do is plug it into a 110 volt electric outlet, fill with solution, and scrub! The brush and pad driver are of the "Hands-Free" design, so the operator never has to touch the brush. Simply lay the brush/pad driver on the floor, maneuver the machine over it, and engage the brush drive apparatus. To remove, simply raise the scrub head, and spin the driver once to remove from the brush head. When it's time to transport this machine, simply detach the brush or pad driver and attach it to the side of the machine. 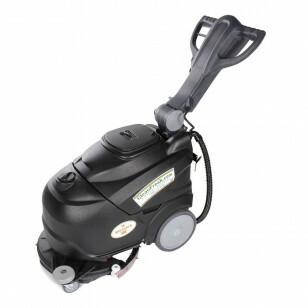 You won't find another machine that is as dependable and feature-packed as this one is within this price range. You simply can't get a bigger bang for your buck! If you're looking to save even more money, you can purchase this machine in a 'Reliable 18E' automatic scrubber package to receive a bunch of degreaser for FREE! We also have many other walk behind scrubbers to choose from including additional CleanFreak® industrial floor scrubbers. You're sure to find just the right machine for your floor scrubbing needs with us, and if not, please give one of our experts a call at 855-242-9029 for a personalized recommendation.